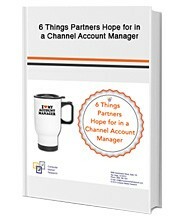 Having the right channel account manager (CAM)is essential in creating a successful and engaged channel partnership. An effective CAM must have excellent skills and competence to select, support, and motivate partners. With this in mind, what are some of the principal makings of an effective channel account manager? To find out, fill out the form on the right to receive your Free copy of “6 Things Partners Hope for in a Channel Account Manager”.